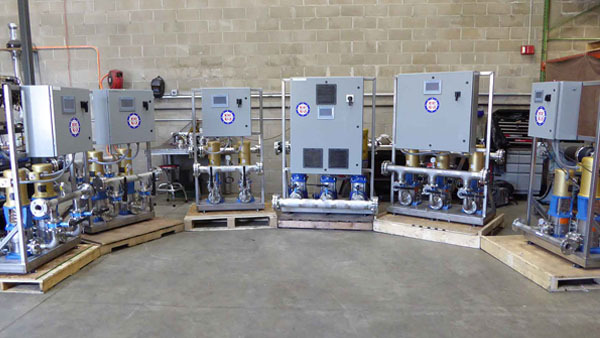 ALL PUMP SYSTEMS CUSTOM BUILT TO YOUR FACILITIES UNIQUE SPECIFICATIONS! All of our Pump Systems are specifically engineered for exceptional overall performance. As well as easy installation and maintenance. Our pump systems are commonly installed in commercial facilities. Our systems can be found in apartment buildings, office buildings, hospitals, hotels, nursing homes, etc. Primarily, we use pumps from Goulds, Grundfos, Peerless, Wilo, etc. because they meet our stringent standards. Quality is of the utmost importance to us. Our pumps are made from stainless steel materials for both wetted and non-wetted parts. This includes our flanges, pump manifolds, pump base and control panel uprights. Through the use of our PLC based control panel, we have endless capabilities available to you. The HMI touchscreen delivers all the information you need, while giving you the ability to change and access everything with a single touch. The HMI touchscreen delivers all the information you need. While giving you the ability to change and access everything with a single touch. Your set points and parameters are safe with our password protection feature. We are an approved OEM for top brands such as Goulds, Grundfos, Peerless, and more. We manufacture our own Touchscreen Control Panel here in the United States. Pumps are controlled via Variable Frequency Drives and a PLC. Our booster pump systems are engineered in-house specifically to your capacity and space needs. We offer booster systems ranging from simplex to six pumps. Our systems utilize multiple types of pumps including closed coupled end suction and vertical multistage pumps. Our engineers will look at your size restrictions, water demand, and other factors when designing your system and determining the type of pump used. Every system is made to your specific needs ensuring the most energy efficient high performance available. Constant pressure systems are driven by Variable Frequency Drives (VFD) drives which are regulated by demand differentials in your building. We will design your booster system based on usage tendencies of your application using a PLC that is fully programmable to obtain the desired series and variations controlling both water flow and pressure. Roof Tank Systems are designed with either starters or a soft start up, depending on the height of your building. The pumps will be selected to meet your buildings flow and pressure needs taking into account the particular tendencies of your building. The end result will be an energy efficient system running at the right duty point assuring longevity of your booster pump system with minimum energy cost. Our iLevel Sewage systems utilize pumps from the premier manufacturers on the market. Through the use of our highly customizable PLC based control panel we can provide many capabilities and features. Each control panel can be used in either digital or float mode. In digital mode a 4-20mA submersible transducer controls all pump operation functions. You can change the levels (stop, lead, lag and high alarm) directly on our color HMI screen and in case of emergency we offer an analog back-up function that can operate with the use of floats. We have multiple lines of sewage pumps including non-clog, vortex, grinder, cutter and high temperature. Systems can be provided with basins and/or covers to fit nearly any new or preexisting area. The iLevel systems are also available to run on our AIMI SCADA remote monitoring and control service. Utilizing our own private cellular network you can access the control panel from any computer or smartphone device. Make changes, turn pumps on/off or simply check levels and operation wherever you have internet. Our condensate tanks are engineered out by our in-house engineering team to fit your technical and space requirements. The tanks are manufactured in our facility to meet the requirements of your existing system and to fit your desired footprints. Our boiler feed systems are designed in accordance to your systems requirements. We will work with your team to ensure the most efficient option possible and will meet your needs. Our standard hydronic loop system controls the pumps using a pressure sensing technology. As the demand increases in your building, the pumps will speed up to assure adequate flow throughout your heating loop. Our team of engineers will look at not only your requirements, but also the piping feeding your system. We will assure that your system will deliver heat quickly and as efficiently as possible. Our team has developed a patented technology to control your heating loops. Typical heating systems are based off of pressure, but our Delta T system is based off of water temperature. Our goal is to assure that the temperature is maintained, assuring the most efficient heat provided throughout the system. In our Delta T system, we not only monitor the speed of water based on temperature, but we also maintain a desired pressure to assure adequate flow throughout all elevations. Our team will help design a system customized and unique to your project. Our standard chill water systems controls the pumps using a pressure sensing technology. As the demand increases in your building, the pumps will speed up to assure adequate flow throughout your cooling system. Our team of engineers will look at not only your requirements, but also the piping feeding your system. We will assure that your system will deliver cooling quickly and as efficiently as possible. Our team has developed a patented technology to control your chill water system. Typical cooling systems are based off of pressure, but our Delta T system is based off of water temperature. Our goal is to assure that the temperature is maintained, assuring the most efficient cooling provided throughout the system. In our Delta T system, we not only monitor the speed of water based on temperature, but we also maintain a desired pressure to assure adequate flow throughout all elevations. Our team will help design a system customized and unique to your project. We offer two different types of cooling tower technologies Standard. The roof tank system will be controlled either by a pressure switch or a float mechanism in the tank. We will determine your tank fill system to provide adequate water in high demands but not over sizing the system. Proper sizing of the system by our team of engineers will assure you the best efficiency possible and longevity of pumps.Soft Start –In our soft start system the pumps will ramp up and down in the beginning and end of each cycle. We also offer submersible transducers that will enable you to see accurate water levels in your tank. In this system you will also be able to view remotely levels of operation. © 2018 US Pump Corp.